Location: City Hotel is situated not far from the city centre and in close vicinity to the industrial centre of Stara Zagora. Accommodation: All of the apartments over 40 square metres offers kitchenette and cosy bedroom. The living room offers comfortable sofa, 42 inch Plasma TV with over 40 digital channels, cable internet connection, and personal safe. 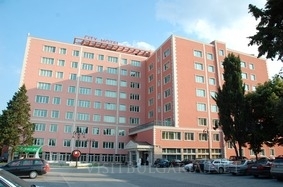 Hotel comforts: The brand new hotel complex in Stara Zagora offers 105 completely furnished apartments and studios. For the comfort of all business travelers the hotel offers two conference halls with 70 and 24 seats, exquisite restaurant, cosy lobby bar, sauna and Jacuzzi. Wine and dine: The City restaurant offers comfortable and cosy atmosphere and delicious Mediteranian kitchen. Lobby bar: The luxurious lobby bar of the complex offers wide range of refreshing drinks, toasts and snacks and is a perfect place to hold meetings.